i am so excited to be kicking off pin it forward! thanks again to victoria for inviting me to be a part of such a fun event. 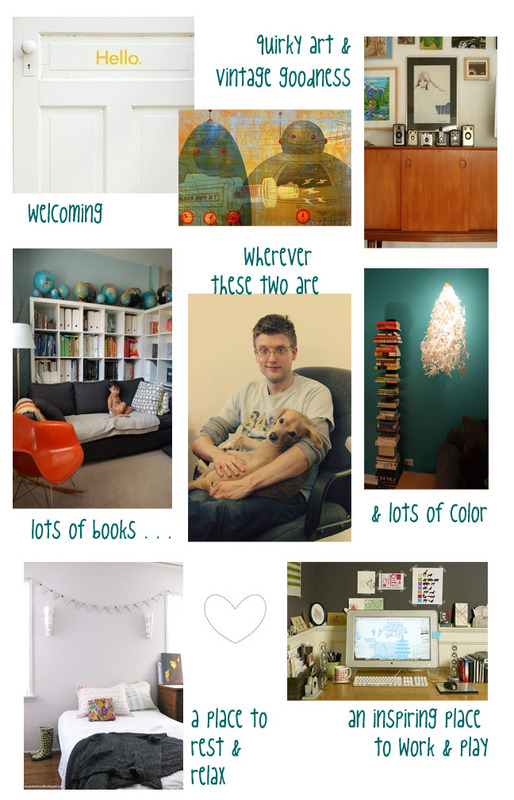 i love inspiration boards and pinterest is such a great way to play with them online. when i thought about "what home means to me," these are the ideas that immediately popped in to my head. i hope you will enjoy them and click over to pinterest to check out the rest of my pinboard! what home means to me . . .
photo credits (clockwise from top left): tastysuite on etsy; what was a happy love by john w. golden on etsy; kimhas7cats (aka kim from desire to inspire); jodi*mckee (hey! that's me!) on flickr; enormous champion via design*sponge; jen at the fabled needle; lovelydesign via cafemom; my family. home is where the heart is. that is for sure. my husband & i have moved around a lot over the past ten years. while i don't always feel completely settled in each physical space that we live in, i know as long as we are together we are home. throw in some color, cozy spots to curl up and read or watch a movie, and a furry friend to cuddle with, and we've got it made. a big thanks to victoria & pinterest for organizing pin it forward. now passing the baton to the lovely nichole of little brown pen. i'm looking forward to seeing "what home means" to her, since she splits her time between the NYC area and paris!